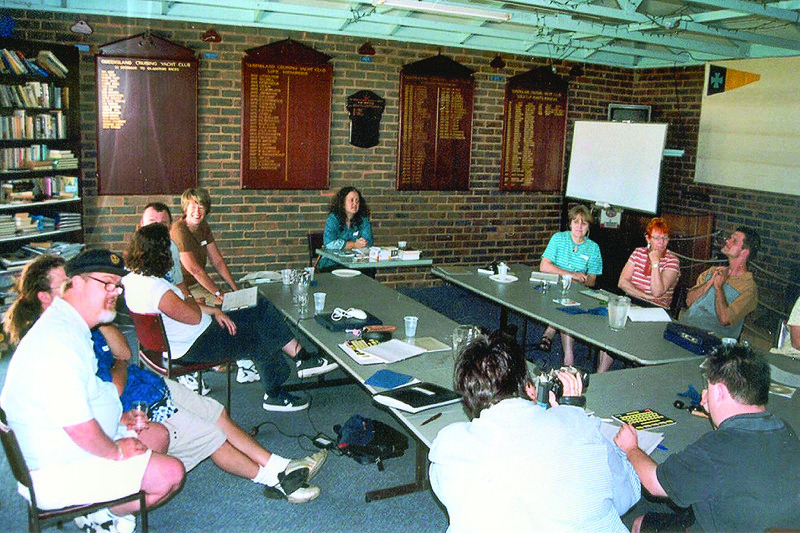 The group was formed in October 2003 with the support of the Lions Club of Bramble Bay, and funds raised by Poets on the Park from sales of their anthology `Images of Bramble Bay’. Krissy Kneen, writer and film maker, conducted three writing workshops at the Sandgate Cruising Yacht Club. The writers who attended had been displaced when the Department of Disability Services withdrew support for the group, ‘Voiceless Wonders’, conducted by speech pathologist, Alice Owen. They were keen to continue writing and so formed the group Brotherhood of the Wordless. A rock band the Bipolar Bears located in Melbourne composed and recorded a song created from one of the early poems of the group. Paul Bodington from ABC Breakfast radio broadcast an interview and the group’s song about Sandgate composed with Peter Vance. Publication of an anthology with a DVD Tapping on the Heart of the World. Terri Delaney and Linsey Pollak conducted two workshops. Terri sang the words written spontaneously on stage with Linsey improvising the musical background. Access Arts sponsored a grant from the Queensland Arts Council for the production of a documentary Waiting to Write by Krissy Kneen and Anthony Mullins. Krissy conducted the writing workshops throughout the year. The group presented at the Queensland Writers’ Festival under Krissy’s guidance. Short film presentation at the Queensland Poetry Festival. The Queensland Writers’ Centre conducted two stimulating workshops. The group decided to create a musical DREEMZ in 2007. It was staged in November 2008 in the theatre at QUT Carseldine. 2009 David Stavanger, a poet who performs professionally as Ghostboy, was engaged to conduct workshops. ‘Air for the Birds’ inspired by David’s guidance was performed in 2010 at the State Library of Queensland with musicians and OuTsideRs, a fringe poetry group. The performance was again presented at the Queensland Poetry Festival that year; Dujon Periera made a professional video which the group continues to sell to raise funds. ‘Big Thoughts from the Frightened Well’ was the group’s next collection of work under David’s guidance. It was performed at the State Library in 2011. The BIG event for 2011 was the Cabaret performed at the Sandgate Town Hall with funding from Disability Services Queensland , ‘Building Supportive Communities’ grant. In 2011 and again in 2012 the group performed at the Woodford Festival under David’s direction. In 2012 poems from both poetry collections were compiled in a back to back book, ‘Air for the Birds’ and ‘Big Thoughts from the Frightened Well’ edited by David. Funding for this was provided by the Queensland Government’s casino grant. A selection of the combined work was performed at the Queensland State Library. 2013 the group presented at the Queensland Writers Festival. The group has been inspired by David Stavanger’s vision for the group, his dedication and enthusiasm. Writer and film maker Krissy Kneen. Graphic designers Kerri Underwood, Alex Sweet. The group owes them a great debt, especially as many of them donated their time to the group. Many thanks to the staff of the Queensland State Library. The group generates a uniquely inspiring atmosphere which impacts the life of anyone who is part of it. It is a privilege to share the wisdom and imagination of the writers. The writers’ lives, in turn, alter dramatically as they have the opportunity to discuss common issues and give each other support. As their talents are recognized and affirmed they become more confident and willing to step up to challenges. Members now speak to community groups and at conferences, undertake courses of study, and travel overseas. Their families support each other and welcome new opportunities with greater confidence.